WHEN Leanne Adams began working at the residence of Brisbane Archbishop Mark Coleridge, she never expected to find the original baptismal font for St Stephen’s Cathedral. The Wynberg house manager started her job in 2012, the same year she stumbled upon the forgotten marble basin, which she said was buried “with lawnmowers”. “For whatever reason it came to Wynberg and it has been under the house ever since, buried under stuff …,” she said. The discovery at Wynberg caught the attention of cathedral dean Fr David Pascoe, who planned to return the forgotten basin to its original home. Handcrafted by Brisbane stonemasons John Petrie and Sons, the marble baptismal font was placed in the cathedral in the late 1880s. It was the primary baptismal font for more than 100 years but was eventually removed from the cathedral. Although little information is known about its removal from the cathedral, long-time archdiocesan support services assistant Patrick Yzelman remembers receiving a call about 10 years ago to move it from a house in the western suburbs of Brisbane. Mr Yzelman and a colleague transported the baptismal font to a garden bed on the cathedral grounds. Another employee eventually moved the historic structure to Wynberg house, home of Brisbane’s Catholic archbishop. On Easter Sunday this year, the font was officially blessed and installed as the new holy water font in the cathedral’s entrance. Fr Pascoe said the holy water font’s placement at the entrance to the cathedral had helped draw more visitors into the holy building. Catholics traditionally make the sign of the cross with holy water from a font as a sign of repentance for sins, for protection from evil and as a reminder of their Baptism. Now Catholics at St Stephen’s Cathedral can also remember the baptisms of the forebears of the faith in Brisbane. 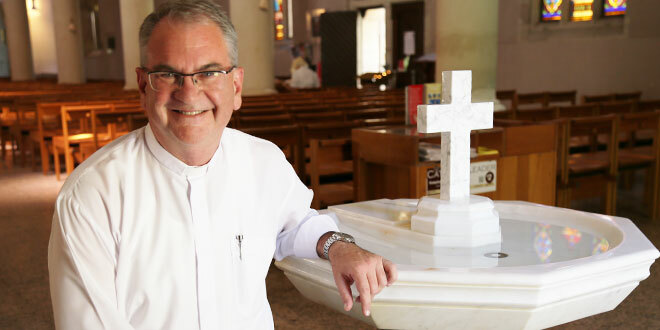 “As it was the baptismal font for the cathedral, and now as the holy water font, it’s that real connection to our baptism and the baptism of others,” Fr Pascoe said. “So many people who would have been baptised in it over 100 years. Previous: What will be Brisbane’s monuments of mercy?